The Batman Script Being Entirely Rewritten, Movie Delayed | Nerd Much? The Batman movie has certainly had a tumultuous development so far. 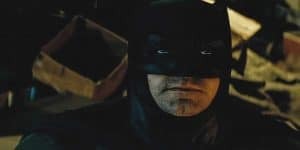 First, Ben Affleck dropped out as director, then Matt Reeves was brought on but negotiations fell through. Now, Reeves is back, but the upcoming superhero movie is being delayed, as Reeves is working on War For the Planet of the Apes until the end of June. But the more interesting news comes from Variety’s Justin Kroll [via Slash Film], who is also reporting that not only will the movie be delayed for Reeves’ previous engagements but Reeves will come back to an entirely brand new script, as the movie is currently being rewritten. This shouldn’t come as much of a surprise at this point, as it’s clear that DC really does want to try and get things right with this one. Last month, we were told that the studio was looking to start from scratch with the entire project, and it appears as though that’s what they’re doing. With a rewrite now underway, it’s quite possible that Deathstroke won’t be a part of the new version of the film, meaning Joe Manganiello might want to start looking for a new job. We’re hoping that this turns out to be the case, as we were much more fond of the initial version of The Batman we were hearing about with Batman fighting his way out of Arkham Asylum. Clearly, eyeing a 2018 release date for The Batman sounds unrealistic at this point, so for now, we’ll pencil it in for a tentative 2019 release. We’re certainly okay with a delay if it makes for a better Batman movie, and it’s good to see Warner Bros. not trying to rush a movie towards a release earlier than it should. We’ll certainly keep you posted, as we’re following all of the latest The Batman news closely.